Shadow of the Tomb Raider was always going to struggle to reach the heights of its predecessors. Rise of the Tomb Raider in particular, in the way it explored the nuances of Lara’s obsessive behaviour and the impact of that on everyone around her, was much smarter than I think most would give it credit for. Almost as impressive is how it managed to wrap that sort of complex story around a blockbuster game that hit every mark on the AAA checklist without ever feeling bloated or aimless. 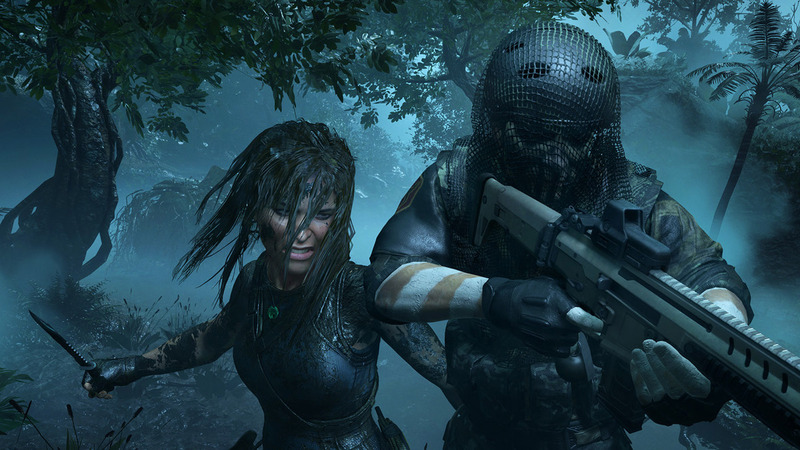 Related reading: Our in-depth look at what made Rise of the Tomb Raider‘s story work so well. I didn’t necessarily expect Shadow of the Tomb Raider to meet such a high bar, but I didn’t expect it to fall so far short of it, either. her. Don’t get me wrong, it’s a competent action-adventure game with plenty of things to do and vistas to admire, but the Tomb Raider reboot series has always been more than that. Shadow, meanwhile, never reaches higher than competent but unremarkable. That’s despite an ambitious opening that sees Lara Croft unwittingly set a Mayan apocalypse in motion as a result of her obsession with cultural theft in the name of archaeology. It’s a perfect set-up for a game that challenges the assumptions at the heart of Tomb Raider (and Uncharted, and Indiana Jones, and the old pulp adventures that inspired them)—the notion that ancient cultural artifacts are fair game for any white archaeologist or treasure hunter intrepid enough to find them. “Not everything is about you, Lara.” says Jonah Maiava, Lara’s best friend (at least, since Sam Nishimura was seemingly erased from existence some years ago) early on, as Lara prepares to continue chasing the latest macguffin with no regard for the damage wrought by her last adventure. It’s built up as a turning point for her—the start of her beginning to realise that her actions have consequences. Then the rest of the game just washes that away. It turns out that Trinity—an evil pseudo-religious paramilitary organisation and longtime Tomb Raider villain—is after the same artifact, G the express goal of bringing about the apocalypse in an effort to “remake the world” in a better. 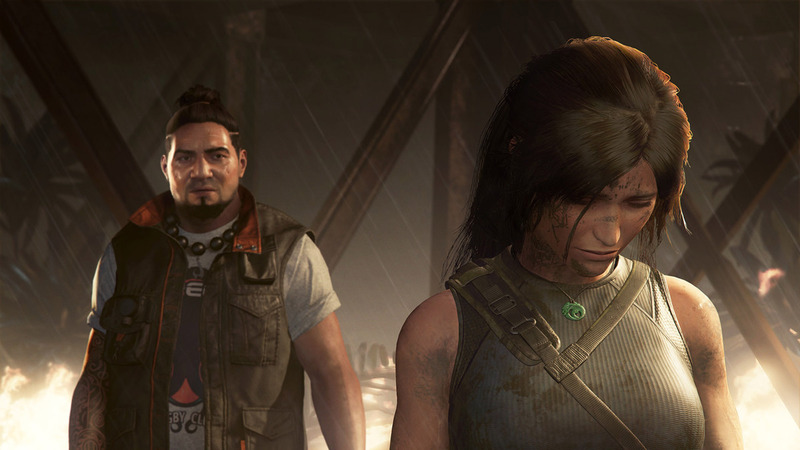 The instigating incident in Lara’s self-reflection would have happened regardless, and once Trinity’s leader reveals his hand, Shadow of the Tomb Raider becomes yet another story of a “good” archaeologist trying to stop an “evil” one through all the same looting, pillaging, and destruction as always. 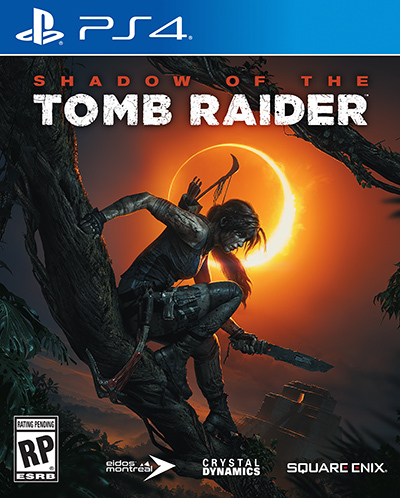 Shadow of the Tomb Raider goes as far as falling back the old white saviour trope, inexplicably turning Lara into the only hope of survival for secretive Mayan community hidden deep in the jungles of Peru. She wears their clothes—to “blend in”, as though no one would notice her white skin and British accent—and becomes a sort of religious chosen one destined to hold back the apocalypse, while dozens of actual Mayan people die in service to her. 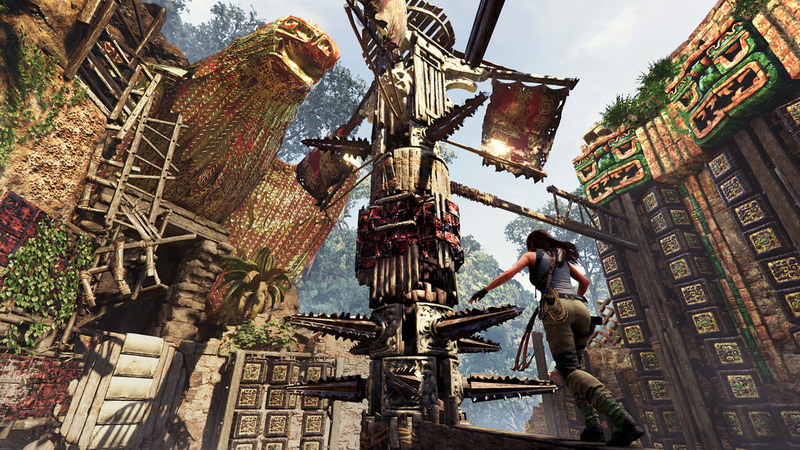 It’s thoughtless and tone-deaf at best and aggressively appropriative at worst—a fact driven home by Tomb Raider‘s long-held system of collectible relics. As well as the many items hidden in dusty old ruins, Shadow has you looting “ancient” artifacts from the homes of living people, while they’re standing there watching you, without any sort of consequence. The oddly-named “immersion mode” only makes the disconnect more apparent. With this option, you can have everyone speaking their native language—either Spanish or an unspecified Mayan language, depending on where in the game you are. However, Lara always speaks English, and is somehow able to understand and be understood by everyone around her. At one point, you’re masquerading as a part of the enemy faction within the hidden city, and in order to get past a certain checkpoint, you need to give a password. When Lara gives it in English, nobody seems to notice, and they just let her through. Related: Waypoint’s Dia Lucina took a much more detailed look at Shadow of the Tomb Raider‘s efforts to tackle its own colonialism. This sort of dissonance is everywhere in Shadow of the Tomb Raider. Why are these merchants in a hidden village in the Peruvian jungle selling the latest firearms? Why do some characters living in complete isolation speak perfect English in cutscenes, then revert back to their native language for idle chatter? How is Lara able to undertake all her usual climbing while wearing sandals and native Mayan clothing? Why does Lara’s version of said clothing include tattoos that magically disappear as soon as she changes back into her regular clothes? After an opening that hinted at something far more thoughtful, it’s a disappointing to see where the story landed. The more personal story of Lara’s development doesn’t fare much better. At the start of the game, she’s a brash treasure hunter obsessed with her next find, and by the end of the game she’s more mature, with a better understanding of the world around her and the context and consequence of her adventures. But rather than the gradual process of learning, confrontation, and acceptance that you’d expect from such an arc, it’s all very sudden: she unleashes a disaster, dwells on it momentarily, then learns that she can undo it by continuing to do exactly as she’s done, only with a more noble goal at the end of it. Compare this with Rise of the Tomb Raider, which took Lara on an almost identical arc but did so with far more nuance and care. 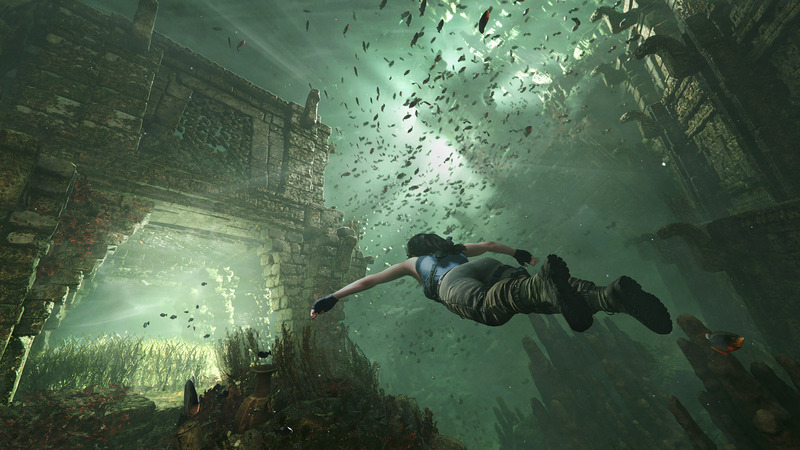 That game took the brutal killer from the end of Tomb Raider 2013 and slowly shaped her into an archaeologist who understood her place in the world (more or less) through a series of trials both personal and grandiose. It was a slow burn, but deliberately slow, carving away at Lara’s stoic exterior to find something more substantial underneath. Shadow of the Tomb Raider seems to have erased all that development, only to retell the same story in a far more clumsy fashion. If you can look past those glaring narrative missteps, the game underneath them, at least, is as competent as ever. It mostly sticks to the same formula as the previous two Tomb Raider games, with a combination of environmental puzzles, exploration, third-person shooter combat, and stealth. To its credit, Shadow of the Tomb Raider has toned down the mandatory gunplay—easily the weakest part of the previous games—and all but a few encounters now able to be dealt with stealthily. To help with that, there are a couple of minor but helpful additions: you can now hide in the foliage covering a lot of walls in the Peruvian jungle, and by covering yourself in mud, you can hide by muddy walls as well (and generally make yourself more difficult to spot). There’s also a new “fear arrow”, which very helpfully poisons an enemy with a hallucinogen and tricks then into attacking their allies. A much more questionable addition is underwater stealth, a misguided idea that combines two of the game medium’s biggest frustrations—forced, instant-fail stealth and fiddly underwater movement. If a group of piranhas catches you, it’s an instant game over, but you can hide from them in patches of seaweed (I don’t think piranhas hunt by sight alone, but whatever). Without any of the usual stealth tools available to you, and with the added detail of a limited air supply, these sections just turn into a tedious case of trial and error. Everything else largely remains the same as before, but that’s for the best. Solving the various puzzles that block your way forward is as satisfying as ever, especially the trickier ones within the optional challenge tombs. There’s a wealth of collectibles to find and challenges to undertake, but they never feel like pointless busy work. The fact that this isn’t an open-world game helps with that, too, as it’s easier to compartmentalise the different zones and avoid being overwhelmed by icons. Perhaps the best innovation in Shadow of the Tomb Raider is in how it approaches difficulty options. Instead of the standard array of easy, normal, and hard, Shadow lets you independently set the difficulty for puzzles, exploration, and combat. With puzzles, this affects what clues (if any) the game gives you; with exploration, it determines how well signposted paths and interactable objects are; and with combat, it affects how much damage you receive and how much health enemies have. Scalable difficulty for combat is standard, but it’s great to have those options for the other aspects of the game, too. 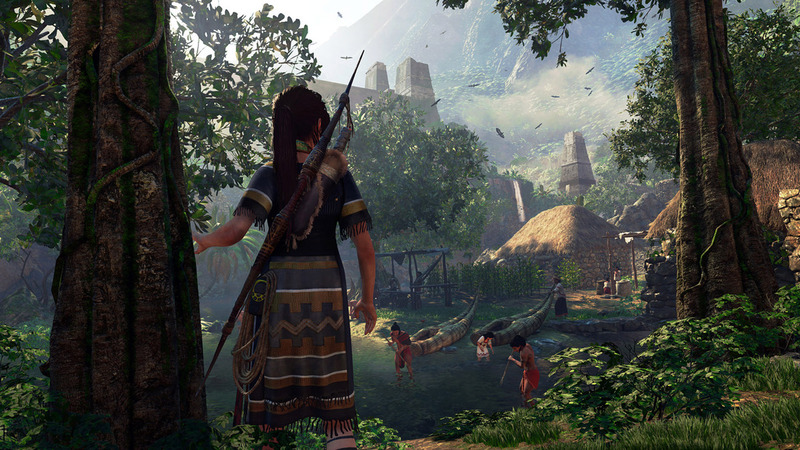 This makes Shadow of the Tomb Raider a game that’s enjoyable enough to play. It finds a nice balance between action and adventure, and makes its many different objectives, both mandatory and optional, rewarding enough in their own right. It takes you to a bunch of stunning environments, all beautifully rendered and with plenty of opportunity to stop and soak in the view. But it’s let down by a narrative that, despite its initial ambitions, never really has anything of note to say and falls back on the same old cultural appropriation that’s long plagued this genre of story. After the progress that Rise of the Tomb Raider made, Shadow‘s insensitivity and uneven characterisation feels like a huge step backward, and a weak ending to an otherwise excellent reboot trilogy.